With Father’s Day coming up on Sunday, thought you might like to cook him up a very yummie appetizer. You can also make this “lite” by using low fat cheeses and turkey bacon, but I think dad deserves the real deal!!!! Enjoy…. In a small mixing bowl add cream cheese, cheddar cheese and Cajun seasoning. Mix until well combined (you can also use a food processor). Place creamed cheese mixture in a gallon size zip-lock bag. Cut the corner of the bag ½ inch width, creating a tip. 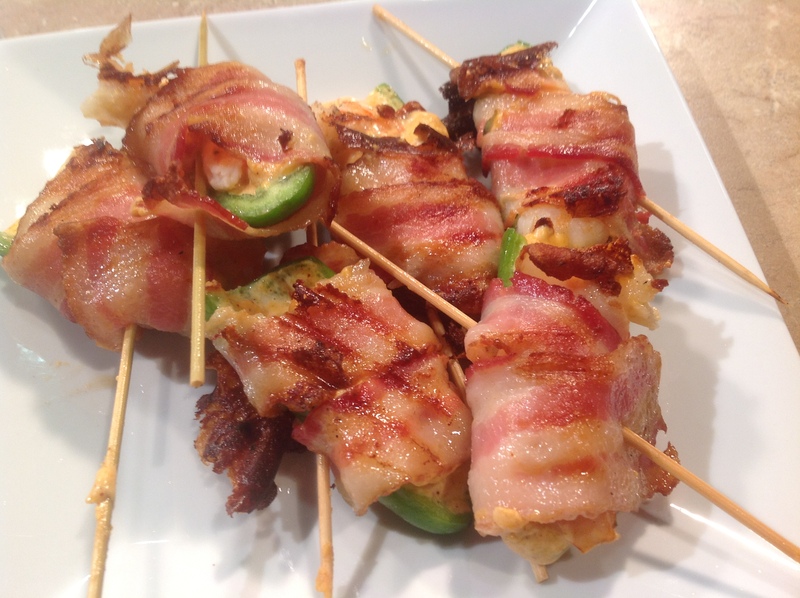 Squeeze the cheese mixture into the jalapeno, top with piece of shrimp and wrap a slice of bacon around jalapeno. Thread the stuffed jalapeno onto wooden skewer. Place skewers onto a sheet pan and bake at 425º for 5-10 minutes or until bacon is crispy. If preferred, cook on a hot grill placing the jalapeno shrimp side down, cook 2-3 minutes, turn and cook an additional 2-3 minutes.